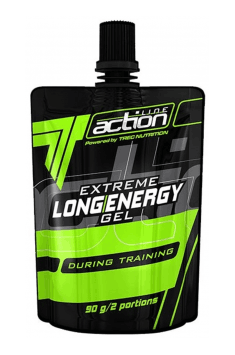 Trec Extreme Long Energy Gel is a high energy gel providing carbohydrates with different absorption times and branched chain amino acids (BCAA). In addition, the gel contains ingredients such as L-carnitine, beta-alanine, caffeine and guarana extract that increase training capabilities. The product aims to provide an easily absorbable source of energy during prolonged and heavy physical effort. The gel contains the carbohydrates that are a unique combination of simple and complex sugars, which at the same time provides a rapid increase in energy levels and long-term release of sugars into the bloodstream. Glucose is the basic energy fuel for working muscles, and its increased supply positively affects athletic performance. It is stored in muscles in the form of glycogen, constituting a reservoir of energy. During long-lasting physical exercise, muscle glycogen stores are reduced and the body is unable to maintain the intense training. The gel contains maltodextrin and isomaltulose that provide long-lasting and stable energy release and dextrose, which has a high glycemic index (IG = 100) and quickly raises blood sugar levels. BCAA branched amino acids (L-leucine, L-valine and L-isoleucine) participate in the protection of muscle proteins against catabolism. Long-lasting and heavy training leads, after some time, to the intensification of muscle-degrading processes in order to obtain energy from it. The intake of BCAA amino acids means that they will be used for energy purposes in the first place, saving valuable muscle tissue. L-Glycine is a simple endogenous amino acid that participates in the transformation of glucose to high-energy compounds, in the synthesis of creatine and in the transport of hemoglobin. L-glycine is also necessary for the proper functioning of the nervous system, helping to reduce fatigue and to improve cognitive functions. Taurine is an endogenous non-protein amino acid that participates in maintaining the proper functioning of the nervous system by influencing the optimal concentration. In addition, similar to the BCAA amino acids, taurine exhibits anti-catabolic activity, regulates the water level in cells and participates in the transport of nitrogen and creatine in the body. Beta-alanine is the chemical compound of the amino acids group. It converts to carnosine, which in turn, is a buffer for hydrogen ions generated during muscle work, especially during insufficient oxygenation. Accumulation of acid-forming hydrogen ions causes that the pH level in the muscles decreases and the unpleasant feeling of tiredness and "burning" of the muscles increases. Carnosine neutralizes hydrogen ions, thanks to which it maintains the optimal pH beneficial for muscle work. L-Carnitine is a substance that allows fatty acids to be transported inside the mitochondria, where they undergo a beta-oxidation process, i.e. "burning". L-carnitine thus facilitates the efficient use of fatty acids for energy purposes and positively affects the work of mitochondria. Guarana extract (Paullinia cupana) and anhydrous caffeine have a beneficial effect on sports performance. Caffeine delays fatigue by blocking adenosine receptors and replacing the adenosine site - a neurotransmitter inhibiting the central nervous system. In addition, caffeine inhibits the breakdown of cyclic adenosinophosphate (cAMP), thus increasing and prolonging the action of adrenaline and noradrenaline, which mobilize the body during physical effort. Guarana additionally increases the caffeine properties and does not cause a rapid drop in its level, which could intensify the feeling of fatigue. To sum up, Trec Extreme Long Energy Gel is a professional gel that provides the necessary energy for working muscles. The BCAA amino acids will help to maintain muscle mass and reduce damage to muscle fibers. Caffeine will reduce the perceived level of fatigue at the level of the nervous system and will allow to maintain high intensity of training. The gel is recommended especially during prolonged and intense physical effort and while practicing such sports as long-distance running, cycling or team sports. Take 45 g of the gel (0.5 sachets = 3 tablespoons) in small portions before, during or after training, twice a day. It is not recommended to exceed the recommended daily dose during the day. Do not take in the evening, because the caffeine contained in the gel can have impact on the sleep rhythm and nocturnal regeneration. Do not combine with other sources of caffeine. To increase efficiency, it is recommended to take 5 g of creatine per day. Water; thickeners - guar gum, xanthan gum; acidity regulator - citric acid; aroma; preservatives - potassium sorbate, sodium benzoate; sweetener - sucralose. Isomaltulose is the source of glucose and fructose.